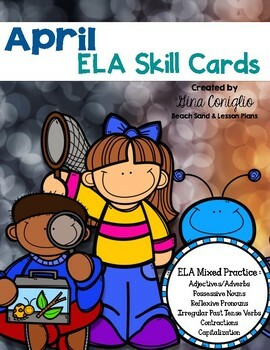 April ELA Skill Cards give students a chance to practice adjective/adverb, contractions, reflexive pronouns, irregular past tense verbs, capitalization, and possessive nouns. 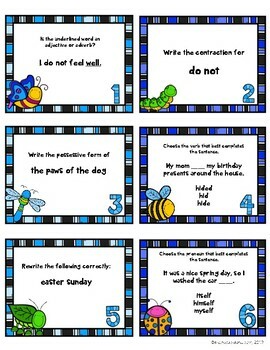 These cards are perfect for 3rd grade practice, high 2nd graders, or review in 4th or 5th grade. 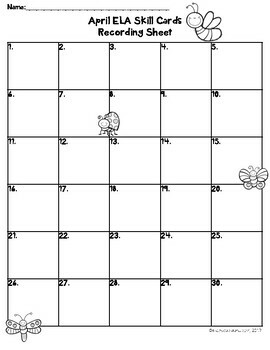 Included are 30 April-themed task cards perfect for a game of Scoot, centers, morning work, or as an ELA warm-up. Use these during your guided reading groups, too! Included with the cards are an answer sheet and recording sheet for the students. These cards come in a color set with 6 cards per page. I suggest printing once and laminating so you can use them year after year.